Administrators can schedule work tasks for all staff on the work schedule calendar. Create customer work orders and assign to staff on the work scheduler calendar. Create daily, weekly, and yearly recurring work tasks or customer work orders. Google Places address validation and auto-fill customer and staff addresses. Organize and manage your worker's service work schedules in an easy-to-use drag and drop Calendar. Click on an empty time slot in the workers daily, weekly or monthly view to a create a new customer job. Click on an existing customer service job to edit and update it. Drag and drop a pending work task/order to another time slot. Reassign a workers daily work schedule to another worker or move all the pending jobs of a worker's schedule from one day to another in cases of emergency, vacation, appointments or some other event. Create new invoices from scratch or convert customer work orders to an invoice. Send a personalized email with your invoice to your customer. Receive a notification when your customer has viewed their invoice. Your customer can view and download their invoice online. Manage invoices based on their status including: not sent, sent, viewed, past due and paid. No need for workers to come to the office to get their daily work schedule. Workers can login with their smartphone or tablet for example and get their schedule for that day. Workers can update their work orders and tasks. Workers can view customer's address in Google maps. Workers can view their daily, weekly or monthly work schedule on a calendar. Through text and email, workers can receive notifications of any updates to their daily work schedule. Email customers and staff directly from the application. Click to call buttons and links through out the application allow all participants to quickly communicate with other staff and customers. Search and report on all past, present and future work schedules. Report on completed work orders to know which ones are ready for invoicing. Report on all customer work orders that have been invoiced. Create individual customer accounts through a web form. Owner and administrators can create, edit, search and report on staff accounts from the user-friendly account Interface. Dashboard provides quick shortcut buttons to the main features of the application. Dashboard shows a status bar chart and percentage guages of total, pending, completed, and cancelled work for the current year. Create and send out a promotional HTML email campaign to your customers. Copy a previous email campaign and resend it. Send a test of the email campaign to yourself before sending it to your customers. Pause an email campaign and resume it at a later time. Search and report on all past email campaigns. Work from the cloud where service work schedules, staff and customer data are securely stored and backed up. Organize and manage the scheduling of your customer service jobs in a paperless environment. Since My Work Scheduler is in the cloud, there is nothing to download and install, just open up your browser and log in. The application can be accessed from anywhere and can be used on all devices including smartphone, tablets, iPads, laptops and desktops. Here are a few types of industries that use work scheduling. This list is not exhaustive as there are many more industries out there where work scheduling is part of their business process. The plan determines the maximum number of staff accounts that you can create inside the App. What problems does the application solve for you and your business? "We now have full access to our customer base electronically and the tech's view their daily work load from their smart phone - these options increase efficiency." Can you comment on the support that is provided when issues arise or application needs new features? "Support has responded promptly by email, text or phone calls whenever there has been any issues or questions. Features were tailored for our specific needs in order to have things run smoother for our business." What specific feature did you like most about the application? "Being able to search customers at a later date to see work that has been performed and materials used would be the most liked feature." What are three other benefits of the application? "Other benefits: The tech's can view their work load the night before. The tech's log their arrival and leave times for each work order and list the materials used. The office clerk then invoice's accordingly. The email campaign, allows you to promote products, monthly specials, etc. This is a great tool for marketing." Would you recommend this application? If so, why? "I'd recommend this application. Having access to our customer base electronically saves time when searching for info." "Using the scheduler will save on paper, ink and printer costs." "It helps us revise schedule faster and to see what we have done for a customer in the past." "I just call support and they can help you over the phone very quickly to get things fixed." "It is very user friendly and it is fast for me to find previous things that we have done and it is faster to do a schedule once a customer is in the app." "Our techs use it so we can see what they did and what they used, I can input a customer and everyone else can see it, also less paperwork to deal with"
"I would recommend it as it has made scheduling easier for us and our installs." "This can help anyone who does schedules and has techs on the road as it is easy to use." Live chat, email support and customer phone support. 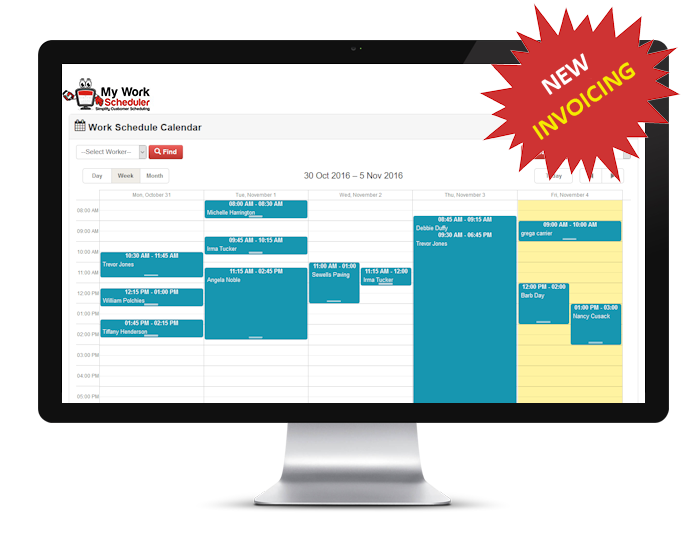 Want specific features added to the My Work Scheduler application to meet your business requirements? We would love to hear from you as we are constantly adding more features to the application.